Rosemary Clooney : Big band vocal charts from Rosemary Clooney. 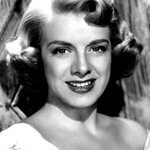 A selection of Rosemary Clooney vocal arrangements for solo vocalist with big band. Born in Maysville, Kentucky, she was an American singer and actress. She began singing and recording with Tony Pastor's big band on the Columbia Record label in 1946 and set out on a solo career in 1949. She made several films in the 1950's including "Here Come the Girls" and also "White Christmas" alongside Bing Crosby. Her television career included guest starring in the NBC medical drama "ER", alongside hew nephew George Clooney. Her performance earned her an Emmy nomination. She passed away in 2002 and she is buried at Saint Patrick's Cemetery, Maysville. Which charts was she well known for? Here are a few that are instantly recognisable. "Get Me To The Church On Time", "Sway" with Perez Prado, "Oh You Beautiful Doll" and "You Took Advantage of Me".